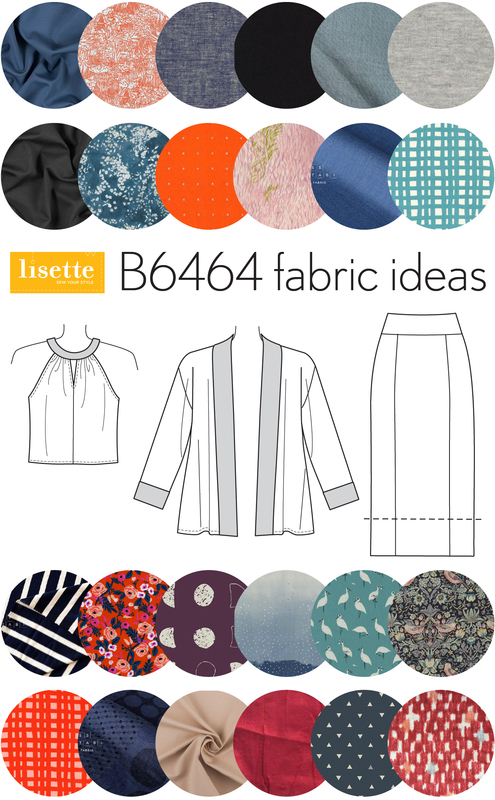 I thought it might be useful to share some fabric ideas for what you can use to make the new Lisette B6464 pattern. Fabric shopping can be tricky, but there are so many great options available right now! Since Lisette for Butterick B6464 is a collection of three separate items that are designed to work together as well as with the rest of your wardrobe, I thought it would be fun to design outfits for you. After all, the secret to having a great wardrobe that works for you is to do a little planning. If you design your clothing within a tight color palette of two or three colors with an accent color or two and you choose patterns and textures that work together, you’ll have many more mix-and-match options and you’ll get lots more use out of the clothes you sew. We can talk about that whole wardrobe-planning idea in more detail later, but for now I’ve made a Pinterest folder with my fabric choices. Then I selected from those choices to develop coordinating micro-wardrobes or outfits with appropriate weights and drapes for each style. You’ll see that I left some additional choices as well, so even if you don’t care for one fabric you might find another to replace it. I drew from several sources, but you can often find the same fabrics elsewhere. For example, lots of stores carry Cotton + Steel, Robert Kaufman, and Kokka fabrics. And if you’re looking for ponte, you’ll find it in many stores. So hopefully this will inspire you and help you start thinking about your likes and preferences. Outfit #2 uses lawn for the top and takes advantage of color-blocking options for the jacket, which is also lawn trimmed with quilting cotton. The skirt is a sand-colored ponte. Going slightly cooler in tones for outfit #3, I mixed blues and deep reds with a blue undertone. (That sounds so fashion-y, sorry. Old habits die hard.) Crinkle gauze top, double gauze jacket, and ponte skirt. Outfit #5 has a tighter color palette. The top is rayon, again, with a printed cotton jacket and a black ponte skirt. And outfit #6 goes back to those deep shades of navy and darker blue. The top and jacket are both double gauze, and the skirt is jersey. With this striped jersey I might play with the stripes a bit. If the fabric is stretchy enough you could alternate directions, and if it’s not stretchy enough you could still stagger the stripes instead of matching them. Here’s what I pulled from my stash for my own outfit, since black and navy are both important colors in my urban wardrobe. For the top I bought just a small amount of black Liberty of London Strawberry Thief last year, and I’m planning to use gold metallic piping around the yoke, just for the fun of it. My jacket will be linen/cotton chambray, which is technically less drapey than the pattern calls for but I think it will work just fine. And I’ve been saving a heavy black cotton/spandex power knit for this skirt. You can always add another coordinating top or jacket and you’ll expand your mix-and-match options right away. You’ll see that I left several additional choices in the Pinterest folder for this possibility. I’ll show you how they turn out when I finish them, and I hope you’ll do the same! Tag your images #B6464 on Instagram or add them to the SewLisette Flickr group when you’re ready because I can’t wait to see what you do with these patterns and which fabrics you choose!